SHC/The Arc of Medina County and the Medina County Board of Developmental Disabilities have developed a specialized babysitting training program that prepares sitters to care for children with and without developmental disabilities. 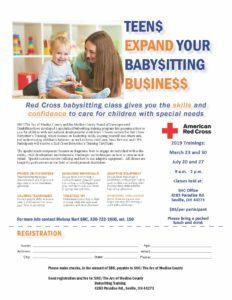 Classes include the Red Cross Babysitter’s Training, which focuses on leadership skills, keeping yourself and others safe, and understanding children’s behavior, as well as basic child care, basic first aid, and CPR. 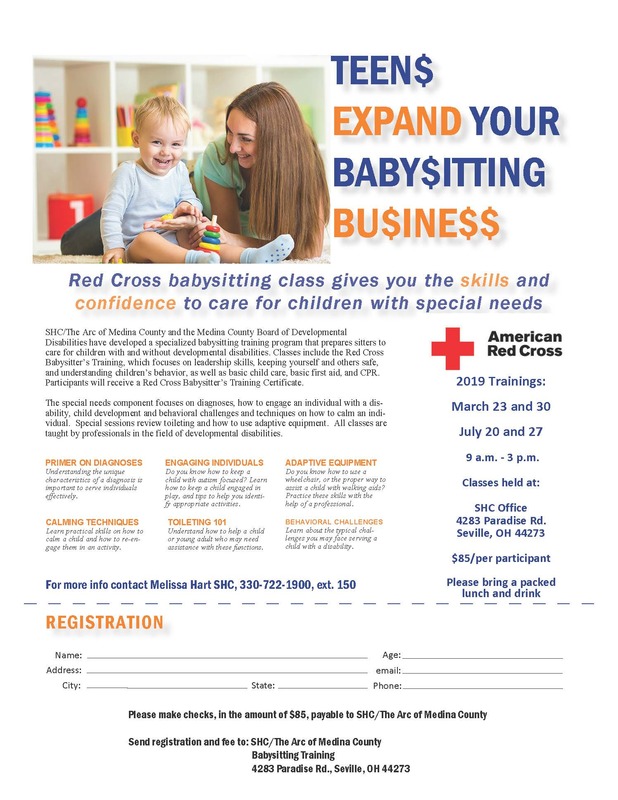 Participants will receive a Red Cross Babysitter’s Training Certificate. The special needs component focuses on diagnoses, how to engage an individual with a disability, child development and behavioral challenges and techniques on how to calm an individual. Special sessions review toileting and how to use adaptive equipment. All classes are taught by professionals in the field of developmental disabilities. Understanding the unique characteristics of a diagnosis is important to serve individuals effectively. Learn practical skills on how to calm a child and how to re-engage them in an activity. Do you know how to keep a child with autism focused? Learn how to keep a child engaged in play, and tips to help you identify appropriate activities. Understand how to help a child or young adult who may need assistance with these functions. Do you know how to use a wheelchair, or the proper way to assist a child with walking aids? Practice these skills with the help of a professional. Learn about the typical challenges you may face serving a child with a disability. For more info contact Melissa Hart at SHC, 330-722-1900, ext. 150 or email mhart@shc-medina.org. The SHC, The Arc of Medina County, partners with individuals with disabilities and their families to provide a full range of services to assist them in living a quality life in their chosen community.